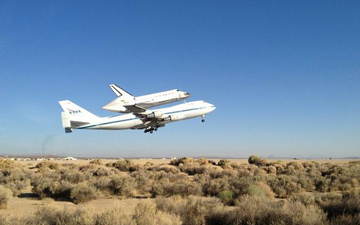 The Endeavour taking off from Edwards Air Force Base at 8:17 a.m. today for its flight north and then back south to LAX. Photo: NASA. Reporters from USC hit the streets and rode the rails, talking to three dozen Metro passengers to get the low-down on area transit. There’s some kind words, some not-so-kind words — and many would like to see the bus and train system expanded. The story is actually a Google map that allows users to click on the locations where riders were interviewed. Clever. And here’s our post — in graphical form — from earlier this week on the results of Metro’s own survey of its riders. The White House is expected to announce today that it will speed up the permit review for the first segment of the California high-speed rail project between Madera and Bakersfield. This means that construction could begin next year on a 24-mile stretch of track between Fresno and Madera. When actual trains will run on the first segment or any segment is still to be determined. A new tunnel is being built for Route 99 in downtown. The challenge: finding a toll that will help pay for the tunnel’s construction and maintenance without pushing too many drivers seeking to avoid the toll onto downtown streets. The problem, in short, is that the lowest tolls result in more people using the tunnel but revenues are needed to make the project work. The tunnel, btw, is replacing the old Alaskan Way Viaduct that was torn down because it was an eyesore that separated downtown from the Puget Sound waterfront. The agency in D.C. is trying to move all riders over to plastic Smart Cards to pay fares (sound familiar?). As an incentive, they’ve been charging a $1 surcharge to riders who continue to use paper fare cards. Problem is, not all stations have ticket machines issuing the new fare cards because the machines didn’t comply with the Americans With Disabilities Act. Hmm. How to properly respond to annoying preachers on trains. Great punchline. A slew of statistics in this article, which tries to figure out whether Americans will pile up the miles behind the wheel when the recession is over — or whether current trends of driving less will continue. Smart piece. Hat tip: Carter Rubin. Four new “Through the Eyes of Artists” posters coming soon! the Alaska Way Viaduct was torn down because it was no longer safe after the quake in 2001, not because it was ‘ugly.’ Is it too difficult to check some facts before posting?